Welcome to the All-Star Summer Moonshot Event! The sixth Diamond Dynasty event in The Show 17 will be the All-Star Summer Moonshot Event. Assemble a team of power hitters and Common pitchers. Each hitter must have at least one power attribute of 70 or more. Diamond, Gold, Silver, Bronze and Common tier hitters are allowed, but only Common pitchers can enter (SP, RP and CP). Your team overall is limited to 80 OVR. All Events are free to enter. Events have their own dedicated lineup, but only player items from your Inventory are eligible. 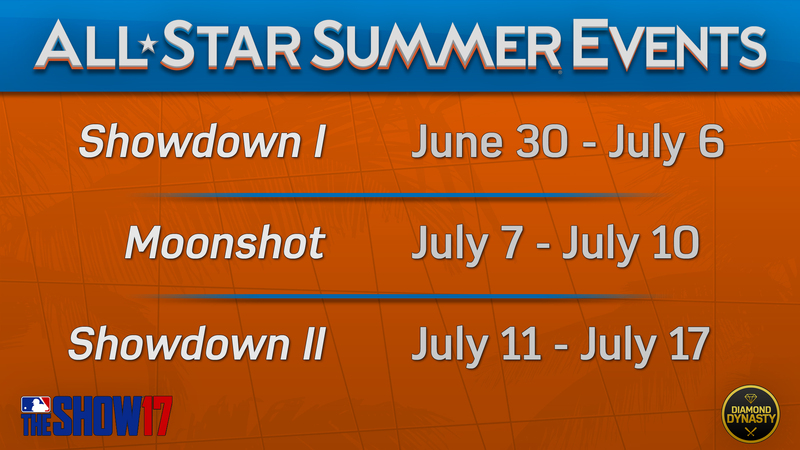 The All-Star Summer Moonshot Event consists of only 3-inning games. The reward system is similar to Battle Royale in Diamond Dynasty where you collect rewards as you pass win-streak reward milestones. There is also a cumulative wins reward for racking up those wins over the course of the Event. Q: Can I sell these rewards when I earn them? Q: Where can I see my rewards? A: In the Events dashboard once the Event begins and you enter your team. Q: If I win 12 games in-a-row, do I get the 3, 6, and 12-win streak rewards? Similar to Battle Royale, two losses eliminates your current lineup from the Event, but you can re-enter for free right away with any lineup that meets the Event requirements. The benefit of double elimination is the opportunity to rebuild your team if you want to swap out players. Q: If I lose 1 game, can I start a new win streak in the same entry to earn Streak Rewards? A: Yes. If you are 9-1 and then win your next 12 games (21-1 record), you can earn the 12-Win Streak Reward. Q: If I lose 2 games and my current lineup is eliminated from the Event, does it reset my Cumulative Wins? A: No, the Cumulative Wins will continue to track until the end of the Event.